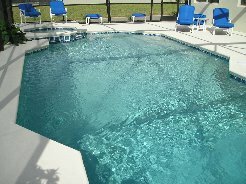 This executive villa in Florida is equipped to a very high standard throughout to cater for all your likely needs. 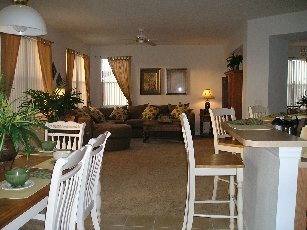 With the year-round weather in Florida all rooms are air conditioned and have ceiling fans for your comfort. There is a spacious family room to relax in together during the day or evening with lavish furnishings, comfortable sofas, an entertainment centre with a 40' LCD TV theatre system, DVD and ipod connection so you can watch your favourite movie or listen to music that you love to hear (we also have a selection of dvd's & cd's). There's also a Sony Playstation 2 for the kids (and adults!) to enjoy while on vacation. (a selection of games are also provided). The sofa converts to a double bed should you wish to use it. There is a 2nd formal lounge and dining room with sofas that also convert to a double bed along with a dining table and table and chairs for some extra space to accommodate all the family. Enjoy your breakfast and snacks with a wonderful view of the pool, with seating for 9 in the family dining area. Additional dining for 6 is in the formal lounge/dining room. The kitchen is equipped with a large fridge, freezer, ice maker, cooker, microwave, dishwasher, waste disposal, kettle, blender, coffee maker, toaster, all crockery and cooking utensils, just like home! It has been fully equipped with everything that you could need to prepare that special family meal, a romantic meal for 2, or a quick snack - which you can choose to eat at our formal dining table, the breakfast bar or al-fresco by the pool. Just off the kitchen is a fully kitted laundry room with a large washer and dryer (incl iron and board). Step out from the family room and on to the sun-kissed pool deck, relax on the cushioned deck furniture, or jump in to the sparkling clear waters of the shimmering and sparkling pool that can be optionally heated, plus a bubbling spa pool to relax in at the end of each fun-packed day. For your additional comfort, there's a pool bathroom situated just off the deck. For added safety, there is a pool safety fence provided, and all doors leading to the pool area have alarms and additional safety lock devices. When you want some more family fun – why not enjoy yourself in one of best private games room around featuring a 7-foot pool table, air-hockey, foosball table, dart board and basket ball hoop. Also provided, are some playing cards and board games. 1. Huge master bedroom with en-suite bathroom, king size bed, bedside cabinets, lamps, clock/radio/alarm, dresser, hairdryer, LCD cable TV and dvd player, huge walk-in closet, his 'n' hers vanity basin, walk-in shower plus roman bath tub and toilet. 2. Spacious 2nd master bedroom with en-suite bathroom, queen size bed with bedside cabinets, lamps, hairdryer, walk-in-closet, dresser with LCD cable TV. The en-suite has a vanity unit, shower over bath tub and toilet. 3. 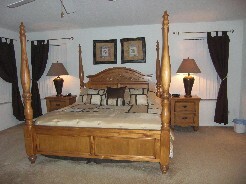 Delightful bedroom with 2 twin beds, nightstand, lamp, dresser, LCD cable TV and a closet. 4. Themed Disney bedroom with a pyramid bunk bed (single on the top bunk and double on the bottom), nightstand, lamp, dresser, LCD cable TV and closet. Large family bathroom with vanity unit, bath, shower, sink and toilet. There is also a downstairs bathroom with sink and toilet, accessible from the pool area and the kitchen. And don't forget the 2 ensuite bathrooms to the master bedrooms.